When it comes to reserving a party bus you don’t have to look much further. Party bus Fort Worth offers you well-organized vehicles which will enable you to conduct a surprise for your friends or guest. We offer stylish but unconventional options to throw the best celebration. Call us for more info, 214-206-9269. You can find party buses with uniquely created interiors that are suitable for any event. We treat all the party big or small with all the seriousness it deserves and will try to transform the event into a great experience that your guests will cherish forever using. You can move on from one spot to the other without restricting your fun and enjoyment by booking a party bus Fort Worth. You can find stretch limousines, hummers, and party buses with capacity ranging from 15 to 32 passengers from our portfolio. Our services are according to the norms set by the state of Texas. If you have a smaller group, with less than 20 people, you can use our Fort Worth limousine service! You can discuss with us your ride needs and budget for travel and request a quote. You can get the best deals by requesting the quote through the telephone or via email. For more information on pricing and availability, call 214-206-9269. Bureau of Engraving and Printing; this is the place where design, engraving and printing of U.S paper currency is done. Hawaiian Falls Water Parks, Adventure Parks; these entertainment complex offer physically and mentally challenging activities for people of all ages. Log Cabin Village; the nine historic structures, log homes and artifacts are worth seeing. Bass Performance Hall-Maddox-Muse Complex; it is home to the symphony orchestra and opera and has magnificent architecture and amazing acoustics. Billy Bob’s; this famous country music club offers music performance every weekend and you can watch live bull riding. 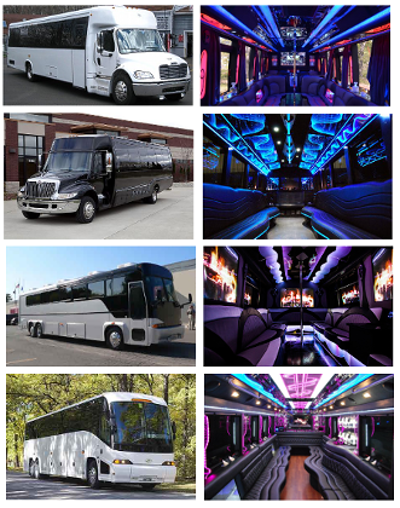 Our party bus rentals offer prices which are tailored according to the demands made by the customers. We can provide reasonable rates depending on the vehicle used, number of travelers, destination and number of hours the bus is used. For large group transportation, charter buses in Fort Worth, might be a more affordable option. Our party buses can be used for airport transportation of big groups from nearest airports such as Dallas-Fort Worth International Airport and Dallas Love Field. We will pick you up and drop you to your chosen destination on time. We offers service to areas such as Arlington, Bedford, Forest Hill, Richland Hills, Haltom City, Saginaw, Garland, Plano, Dallas, Benbrook, etc.